Thank you, Tammy from Plus Size Kitten for sharing with me about the Mr. Lens Affiliate Program. MrLens is e-commerce site that sells quality & reputable contact lenses brand. To name a few Freshlook, Acuvue, Focus Dailies & Soflens. You may find contact lenses for daily, weekly, monthly or colored at an affordable price compared to retail outlets. Free shipping is given for orders to the Klang Valley. 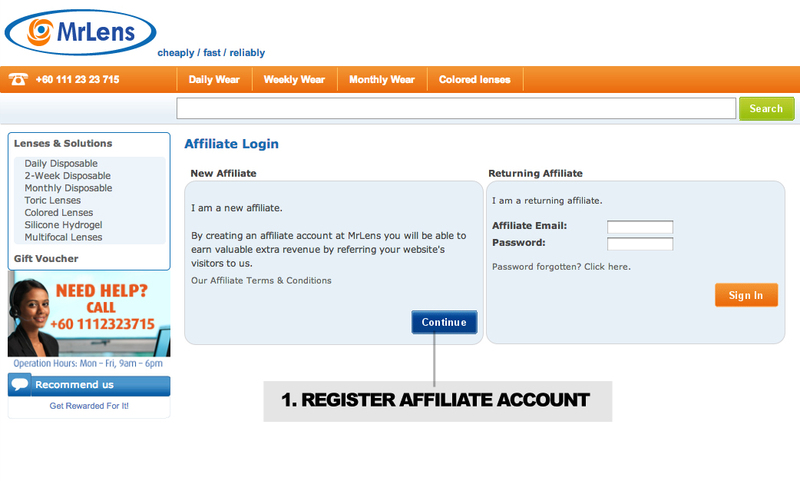 Today I would like to share how you can earn money by becoming an affiliate partner with MrLens. It's real easy and all you need to do is install banners & let the good times roll. By becoming an affiliate partner with MrsLens you can start earning $$ via your website, blog or email. Your readers will click the banners which directs them to MrLens.com.my. 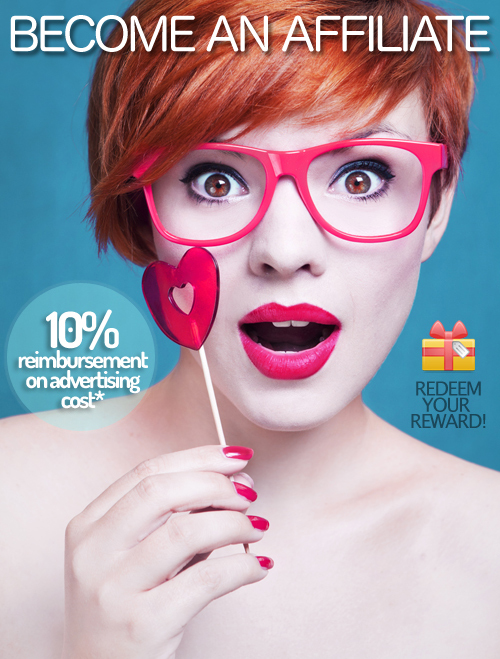 If they like what they see and make a purchase, you get up to 10% reimbursement of advertising costs! 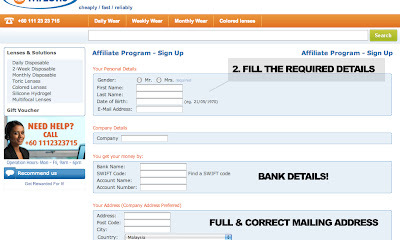 Everything else will be handle by MrLens and you can check your affiliate account to see how much you have earned. For more information click MrLens Affiliate Information. 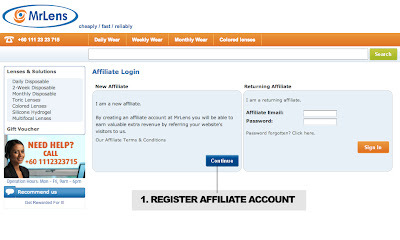 Sign up for an "Affiliate" account. 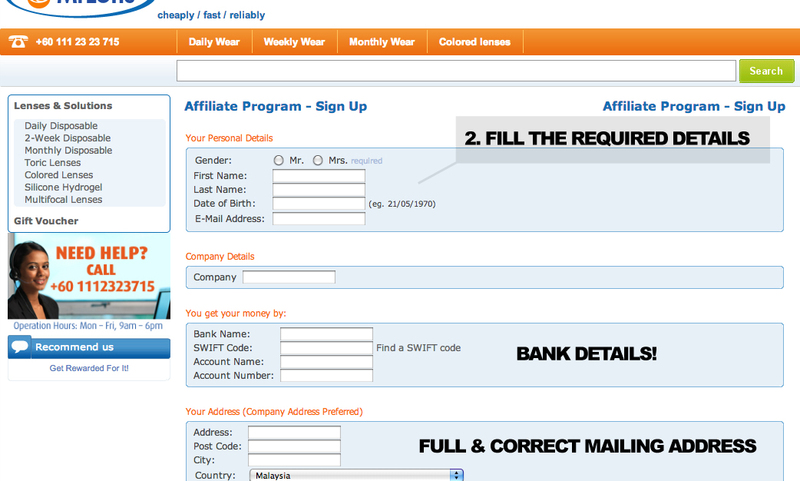 Choose the right swift banking code for your respective banks. Congratulations, you get your welcome message! Next copy & paste the icon code in your blog. Place the code on your layout either on Top of your blogs entries or below. ............ and we are DONE! For all bloggers, Mr. Lens has come up with a special promotion for those who sign up within the month of March 2013. MrLens will be giving away 2 boxes of Freshlook Colorblends (worth RM180) to every blogger who becomes an affiliate & blog about it. •a redemption code will be given to redeem the reward on MrLens •a camera lucky draw at the end of the campaign for a lucky blogger! Yay! 1. This contest is open to any bloggers in Malaysia only from today until 31/3/2013. 2. Become a MrLens affiliate just by registering at www.mrlens.com.my. Please read the terms & conditions to ensure you're well aware of how it works. 3. If you blog about the affiliate program you get a welcome gift from MrLens (2 Boxes of Freshlook Colorblends worth RM180, any color/power based on availability). Please ensure your affiliate banner stays min. 1 month to qualify! (anti-cheat security). 4. Welcome Gift code be emailed to you in after campaign ends, so you can go to MrLens to redeem your preferred Freshlook Colorblends contact lenses. Free shipping for those staying in the Klang Valley. Outstation needs to pay for posting RM6 - RM10. Please check shipping rates at http://www.mrlens.com.my/en/shipping.php. No refunds or exchanges for this campaign. 5. BONUS! everyone who participates will be in the camera lucky draw to win a Nikon Coolpix 300 worth RM1.2k.